I’ve been wanting a new sweater – I feel like I haven’t finished one in ages! It’s kind of an illusion though, because mostly I just haven’t been knitting winter-weight sweaters. But it’s getting cold again so off I go. After a lot of fine projects, these 5mm needles go super fast! 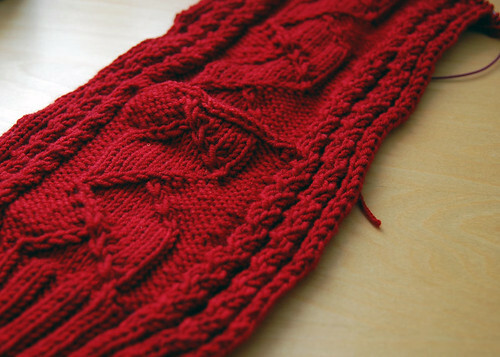 I’m working up a lightly cabled (just on the front probably) cardigan out of some gorgeous red Araucania yarn that I got at Webs after Rhinebeck. It’s so squishy and fabulous – and I love the pocket that I worked in there. I haven’t gotten to knit much today, because I was cleaning up my studio and working on something important for this week. I’m speaking at the Kitchener-Waterloo Knitter’s Guild on Tuesday and apparently I need to have something to say! They’re doing a theme year, about lace, so I’ll be speaking on lace and how it affects fit and shape. I’ll have patterns to sell, lots of sample sweaters and the TYV Sock Knitting truck show too. I’d be delighted if you come hang out! Is that EZ’s “Sheepfold” cable? What a luscious red! Gorgeous! Laura, we’re SO looking forward to having you out on Tuesday. The Guild welcomes guests for just $2, so if anyone reading IS in the area, we would love to see you there! Oh, I love that colour red! I’m excited to see what the cardigan looks like knit up.